Alice Shevlin Hall was constructed in 1906 on the site of Old Main (which was totally destroyed by fire on 24 September 1904). The construction was made possible by a donation of $60,000 by Thomas Shevlin in honor of his wife. The building was executed in the Renaissance Revival mode according to designs by Minneapolis architect Ernest Kennedy. It is two stories in height with a full basement, and is constructed of red sand-mold brick with terra cotta trim and ornamentation. 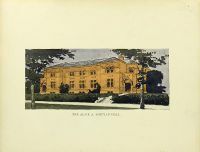 Shevlin Hall was essentially rectangular in plan and measures fifty-five by 114 feet; a large addition to the rear was constructed at a later date to provide for additional dining facilities. The Pillsbury Drive facade (north) is the principal facade with symmetrical arrangement. The center section is comprised of three bays of double windows; those on the second story are of blue and white stained glass and are set within semi-circular arches. The central area is defined by single bay pavilions which project slightly; the corner bays are recessed and contain the entries. The entire building is capped by a low hipped roof with projecting eaves. Originally Shevlin Hall was intended for use by the women students of the University as a sort of "women's union". The interior arrangement consisted of dining facilities, parlors, large study and living room, society and meeting rooms, offices, and an assembly room. Shevlin Hall opened in December 1905 as a building designed to house women's groups. Soon after Shevlin Hall opened in 1906, men at the University began to organize for a place of their own, which led to the creation of the Minnesota Union in 1908. Old Shevlin Hall on the Knoll was converted from a barracks to a dormitory by simply replacing the urinals, painting the bunk beds pale green, and lining the walls with pink wooden lockers. The smaller rooms housed 14 young women and the two ballrooms held almost 40 each. The cafeteria in the basement served double duty as a study area in the evenings. There was a gang shower in the basement plus one enclosed tub for the very modest. (Needless to say, modesty soon became an inconvenient and time-consuming luxury!) In contrast to the Spartan nature of the private facilities, the main lounge, complete with vaulted ceiling, leaded windows, and fireplace, and the smaller "date lounge" were comfortable and attractively furnished. "Upstairs" women, penalized by a two-flight walk from showers and meals, were compensated by a beautiful balcony from which they could check out the frequent male visitors in the lounge.